You may already know that Professor Brian Joseph of Ohio State University will be co-teaching the Advanced Historical Linguistics course at the 2019 LSA Institute, but did you know that this Buckeyes fan would most likely be a professional basketball player in a parallel universe? There is so much more to learn about Brian, and you can read all about them here. 1. Can you please tell us about your linguistic background? I was a linguistics major as an undergrad at Yale (class of 1973), having gotten to that point by starting out as a Classics major and realizing that I didn’t want to read and study Classical literature for the rest of my life but that I *really* liked the Latin and Greek languages. What really sealed the deal for me was spending my junior year in Greece, studying more Ancient Greek and starting learning Modern Greek at the same time. That gave me an appreciation for the scope of the history of the language and I was hooked! I decided to focus on historical linguistics and did just that in grad school (Harvard, Ph.D. 1978) though my exceptional syntax teachers (Judith Aissen and Jorge Hankamer, with some help from David Perlmutter of MIT) turned me on to what was interesting in synchronic theoretical linguistics. I continued to focus on Greek, but expanded my coverage of Indo-European (more exceptional teachers – especially Calvert Watkins, Joki Schindler, and Jay Jasanoff) and ended up trying to blend historical linguistics with theoretical syntax in my dissertation on the syntactic effects of the loss of the infinitive between Medieval and Modern Greek. After a post-doc at the U of Alberta, I settled in to a position at Ohio State University in 1979 and have been there ever since. My areas within linguistics have expanded some. I have done work on morphology, for instance, and have dabbled in all sorts of other areas, including a bit of phonetics and even computational linguistics. And I have focused a lot not just on Greek in itself but Greek in relation to its neighbors in the Balkans, thus looking at language contact issues in a serious way and developing a side specialization in Albanian. My Balkan interest has led me into a joint appointment with the Department of Slavic and East European Languages and Cultures, which has been a boon to my research and my ability to work with students that share my interests. For an overview of my work, visit my website at www.ling.osu.edu/~bjoseph. 2. When did you first join the LSA? I joined the LSA in 1976. I spent the 1976-77 academic year in Greece doing research for my dissertation and being able to read LANGUAGE cover-to-cover every 3 months helped keep me abreast of what was going on in the field (this was before the days of the internet and the web and open access at the click of a button and such). 3. Can you tell us about the course you are teaching at the Institute? I am co-teaching a course on Advanced Historical Linguistics with my good friend and colleague and collaborator Richard Janda. Rich will teach the first two weeks and I will teach the last two weeks. In my part, I plan to cover the question of whether there is grammatical conditioning of sound change (I think not, but we will examine the matter closely) and the extent to which there is predictable directionality in grammatical change. 4. What research are you currently working on? I have been doing fieldwork in southern Albania on the Greek of Greek-speaking enclaves in the region and that takes up a fair portion of my research time (see https://u.osu.edu/greekdialectology/ for some relevant information). I am also involved in a project called the Herodotos Project, aiming to develop first a comprehensive catalogue of peoples and groups mentioned in ancient Latin and Greek sources and then a database with as much information on each group as can be amassed; the first part has involved me in the computational linguistic issue of Named Entity Recognition (NER) and the development of an NER system for Latin and for Greek ((see https://u.osu.edu/herodotos/ for details on the project). I am also finishing up a long-overdue book (some 20 years in the making!) with Victor Friedman on the Balkan languages, to be published in 2019 by Cambridge University Press. Despite misgivings over the obscene amounts of money involved in big-time college sports, I really do enjoy watching and following college football, especially my beloved Buckeyes! College basketball is a close second. 6. In a parallel universe in which you are not an academic/linguist, what would you be? 7. What are you most looking forward to about Davis? Linguistic Institutes are terrific opportunities to hang out with interesting and generally like-minded people, to extend one’s range of expertise and exposure to the field, and to bask in the glory of our discipline. I have taught at 6 Institutes (1991, 1993, 1999, 2003, 2015, 2017) and ran the 1993 Institute and have thoroughly enjoyed every experience. I guess I am most looking forward to more of the same! 8. Ice cream or Cake? Cats or Dogs? Quarter system or Semester system? I’ve got to watch my intake of both ice cream and cake these days for health reasons, but my wife’s super chocolate cake is my absolute favorite. I am not a big animal person but we have had cats for over 30 years and they have grown on me, and we have cared for our older son’s dog a few summers and that was pretty enjoyable, having her around the house. I have taught under both the quarter and the semester systems and they each have their advantages and disadvantages – not sure which I prefer. I realize these are all very politic answers, but you asked for difficult choices I was not prepared to make definitively. 9. What advice would you give to graduate students interested in pursuing a career in linguistics? Go to a Linguistic Institute – it will be a (trans)formative experience for you, for sure! 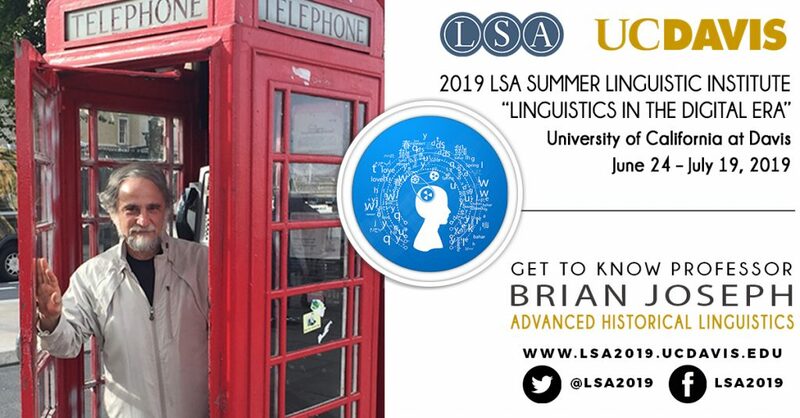 We here at Davis agree with Professor Joseph’s advice, join us at the LSA Institute and check out Brian and Rich Janda’s Advanced Historical Linguistics course! You can read more about Brian’s work here.